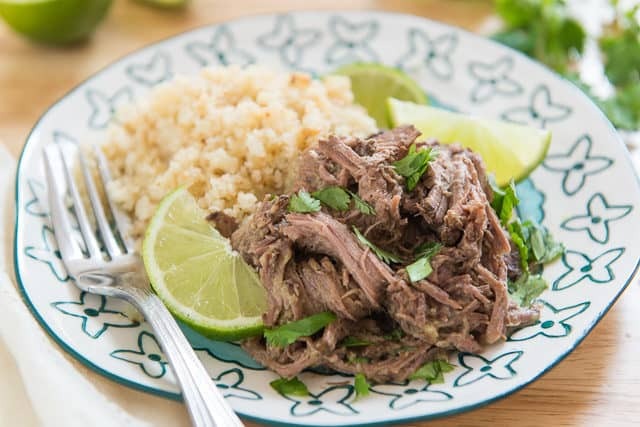 This incredibly flavorful and tender Indian-Style Shredded Beef cooks in the slow cooker for an easy meal that’s great for dinner, and leftovers too! 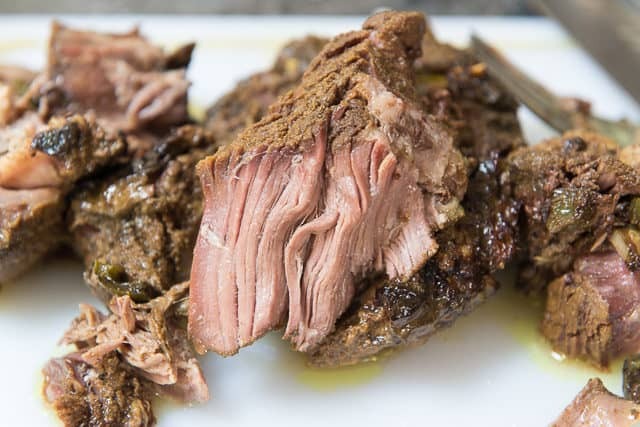 “This is my favorite shredded beef I’ve ever had” is what my husband Pete said about this recipe. And what does my 2-year old have to say about it? I have to agree with my boys on how delicious this recipe is, and fortunately I can say that without sounding like I’m tooting my own horn, because this is my friend Natalie‘s recipe! 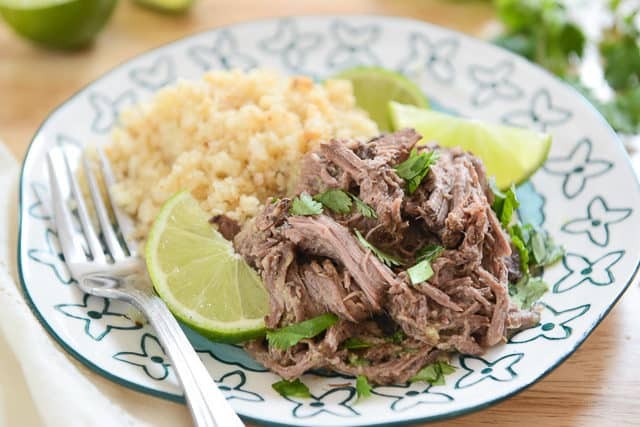 Natalie is the food blogger behind Perry’s Plate, and this beef comes from her recent cookbook The Big Book of Paleo Slow Cooker: 200 Nourishing Recipes That Cook Carefree, for Everyday Dinners and Weekend Feasts. When Natalie sent me a copy late last fall, I bookmarked an obscene number of recipes (as in, I should’ve just marked the recipes I didn’t want to make right away), and it has proved to be especially helpful as I’ve been eating more paleo and Whole30-compliant meals in the new year. Natalie is a wife and mother, which I think lends itself to the qualities of this book. 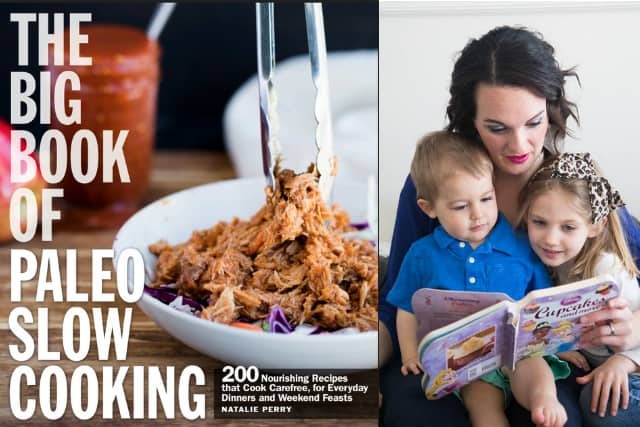 It’s full of big-batch paleo recipes that will feed the whole family, all made in the slow cooker for minimal fuss (check out Natalie’s post here to go on a visual tour of her favorite recipes from the book). This has become one of our favorite dishes too, and the spice rub Natalie uses for the beef is SO good. I think this will become a regular staple for us! Toss it all together, then garnish with extra chopped cilantro and lime wedges. 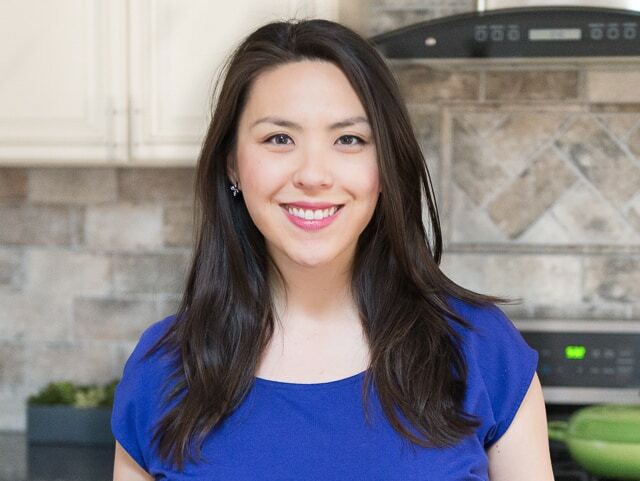 Natalie recommends serving the beef with cauliflower rice, and I found it to be a perfect side to go with it. If you’d like to get a copy of Natalie’s book, you can get it on Amazon or wherever books are sold. One thing I noted about the book is there are SO many recipes in here. I love that Natalie included so many ideas (and 16 shredded meat recipes, because shredded meat is baby James’ favorite). 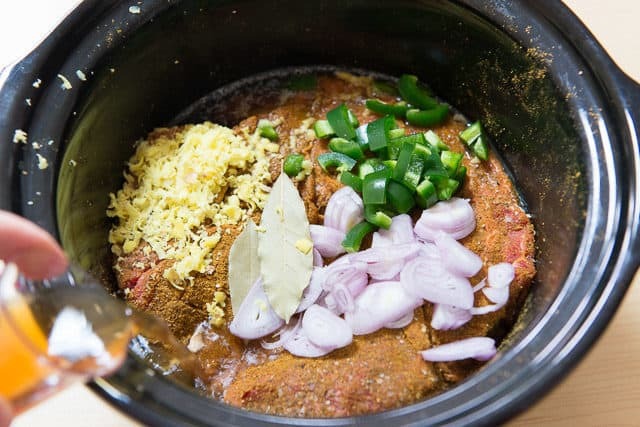 This incredibly flavorful and tender Indian-Style Shredded Beef cooks in the slow cooker for an easy meal that's great for dinner, and leftovers too! 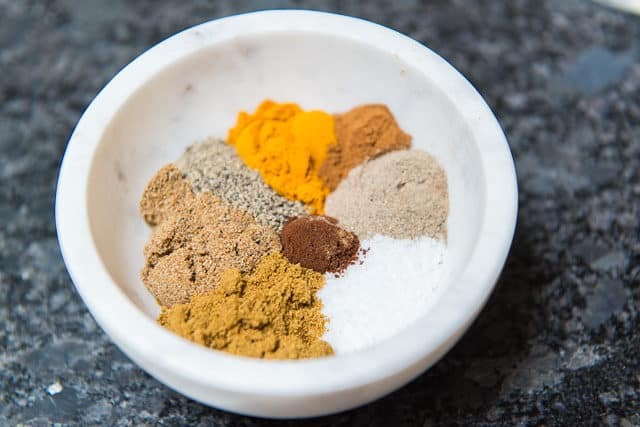 In a small bowl, combine the salt, cumin coriander, black pepper, turmeric, cinnamon, cardamom, fennel seed, and cloves. Rub the spice blend over the entire roast and place it in a 4-quart (3.8 liter) slow cooker. Add the shallots, ginger, jalapeño, and bay leaves to the slow cooker. Pour the beef broth down the side of the cooker. Cover and cook on low for 7 to 8 hours, until the meat is tender and pulls apart easily. 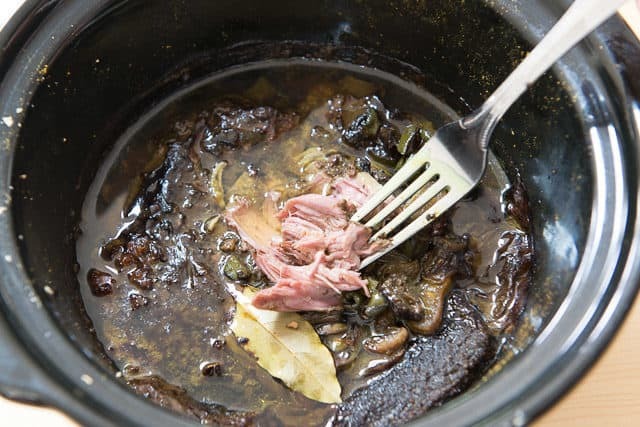 Remove the roast from the slow cooker, shred it into bite-sized pieces, and put it back into the cooking juices*. Add the coconut cream, cilantro, and the juice from half of a lime. Stir it well. Taste, and add more lime juice or salt if necessary. Cut the remaining lime into wedges. 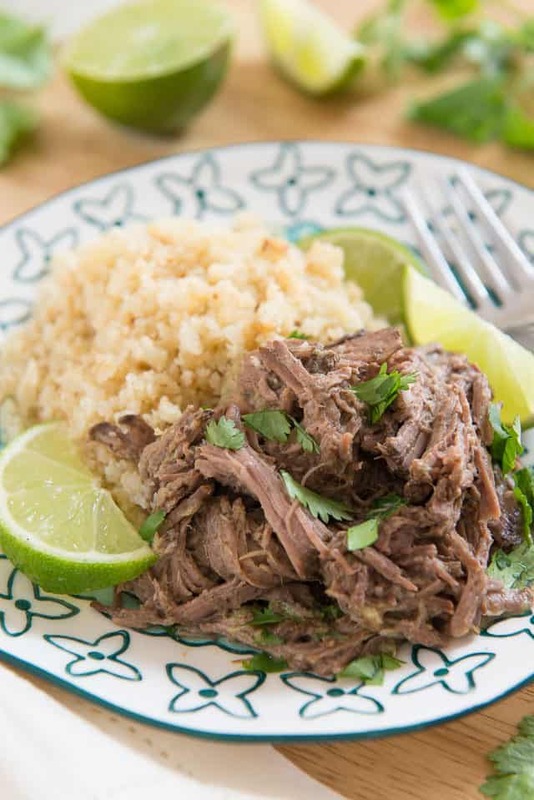 Serve beef over cauliflower rice with a sprinkle of cilantro and a couple of lime wedges. *I skimmed the excess fat off the top. 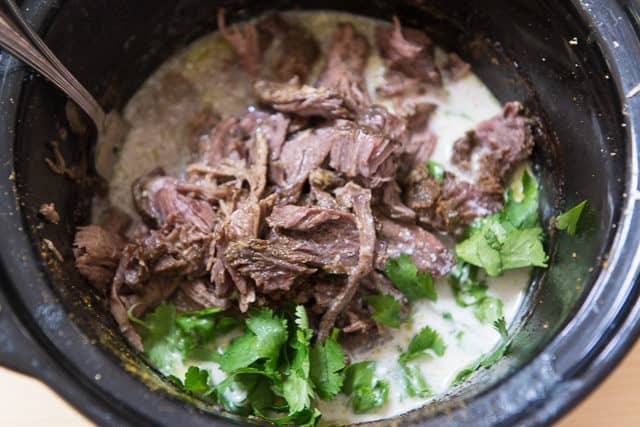 Recipe shared from The Big Book of Paleo Slow Cooker by Natalie Perry, with permission. 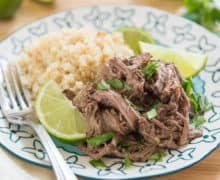 Would it be possible for you to call out a couple of types of beef roast that would be good for a slow cooker recipe such as this? Some do better in the oven, some in the slow cooker without drying out so I was curious which one(s) you might have used. Thanks! Hi Janis, yes of course. Natalie doesn’t specify the type she uses, but I have always used boneless beef chuck blade roast. It shreds beautifully and is nicely marbled, in my opinion. Anything where you see “chuck” in the cut should work nicely. Hi Joanne, thanks for the prompt response. I will use the boneless beef chuck blade roast and if I use another cut and it works (or not) I will circle back and report my findings! I have a pre-mixed garam masala. Would that work for the spice mix or would I need to add more or less of a certain spice? Hi Elizabeth, do you have any of the spices listed here? Subbing straight garam masala wouldn’t work, but if you have some of the spices, you might be able to do parts of each. This looks delicious! Do you think that I could use brisket instead of a roast?